Treat yourself AND keep some extra cash in your wallet by replacing your Prime Rib with a Smoked Strip Loin. This recipe is sponsored by Snake River Farms. Did you know that strip steaks and ribeyes are comprised of the same main muscle? Yup, it’s called the longissimus dorsi. So when exactly does a ribeye become a strip? The transformation occurs between the 12th and 13th rib bone, to be precise. And by no coincidence, that’s where they happen to cut the side of beef for USDA grading. Now it’s true that ribeyes do also contain the most magically delicious of all muscles, the spinalis dorsi. But compared to the size of LD, it’s just a tiny strip. So here’s my thinking: why pay for prime rib when you can easily recreate nearly identical results by using strip loin AND save yourself about $2 per lb?! *MIC DROP* And for a bonus mic drop: it’s even better when you smoke it! Particularly around the holidays, saving a few dollars here and there can be a welcome bonus. You may even choose to reinvest those savings back into the meat, by buying the best quality piece you can afford. Maybe something like Snake River Farms American Wagyu product, which just so happens to be the meat you see in this recipe. 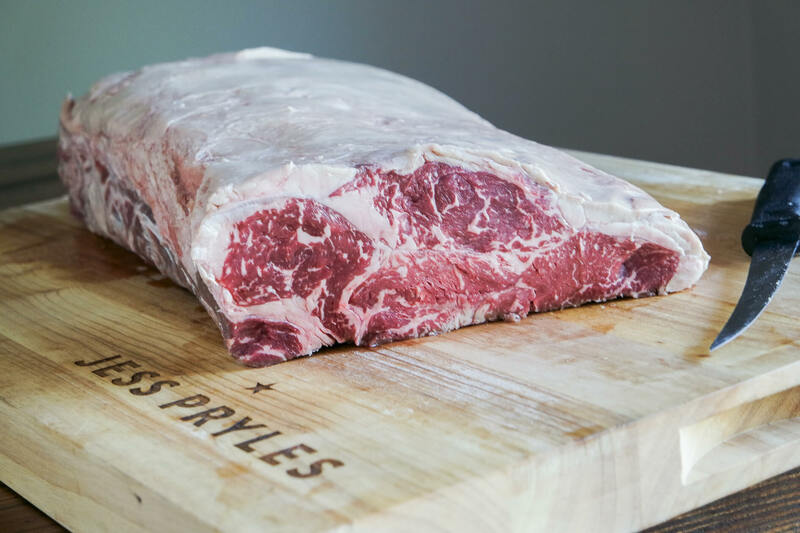 Wagyu beef tends to marble significantly higher than other breeds, and marbling means more flavor and tenderness. Certainly, cooking a whole SRF strip loin is quite an indulgent undertaking, but you can also butcher it yourself, saving half for the roast and cutting the rest into portioned steaks, then freezing. I guess the main message here is: treat yo’self. If you prefer not to smoke the strip loin (I dunno, maybe you dislike complexity of flavor and delicious smokey notes?! ), you can also recreate this recipe in a low oven, before searing over a fire. Note: you can use a smaller section of strip loin, just expect a slightly shorter cook time. Preheat a smoker to run at 250f. Remove strip loin from packaging and pat dry with paper towels. If you are confident at meat trimming, you may gently remove some of the thicker areas of fat cap, and also the silverskin running alongside the thicker edge. However, you can also leave the loin exactly as is and it will still cook wonderfully. Season the loin well on all sides and edges with salt and pepper. The exact amount will depend on the type of salt you are using, but be generous with the application, and massage in well. Place the loin in the smoker. If using a probe to monitor temperature, insert at this point. Cook the loin until it reaches an internal temperature of 123f. Use a good quality probe or thermometer to monitor the temperature – it’s imperative that it not overcook. To reach temperature, a 15 lb loin will take around 3.5 hours. Once at temperature, remove from the smoker, and wrap tightly in foil. Allow to rest 2 hours, preferably in a cooler. Light a grill to run at very high heat. Allow the surface of the grates to properly warm up to temperature – you will need it to be smoking hot to successfully sear the loin. Place the loin onto the hot grill, and sear for no more than 2 minutes on each side. When the fat cap is facing the heat, it may flare up a bit, so be prepared and use heat protection (such as welders gloves) if necessary. You may also like to use a roasting fork or similar device to assist in turning the roast, as it will be quite heavy to lift with tongs alone. Since you have already rested the meat, you can carve and serve immediately. For the Horseradish Mayo, simply combine mayonnaise with prepared horseradish and stir well, then serve alongside the strip loin.